I really appreciate the 1900 Census. It can often provide a clue to a family history that may not be otherwise seen. Such is the case of Dennis F and Margaret Alice (Mahoney) Murphy. The 1900 census indicates that Margaret had four children and only one was living. The one living in 1900 was Frances Florence Murphy. But who were the other three, when were they born and when did they die? The 1900 Census indicates that she was a widow living at 19 Vitromile Street. It was a multi-unit house and had another family (Dapfeil Coveny [??] – Head with a brother, sister, cousin, and a boarder) at the same address. I looked for Vetromile Street in present-day Biddeford and was unable to find it. 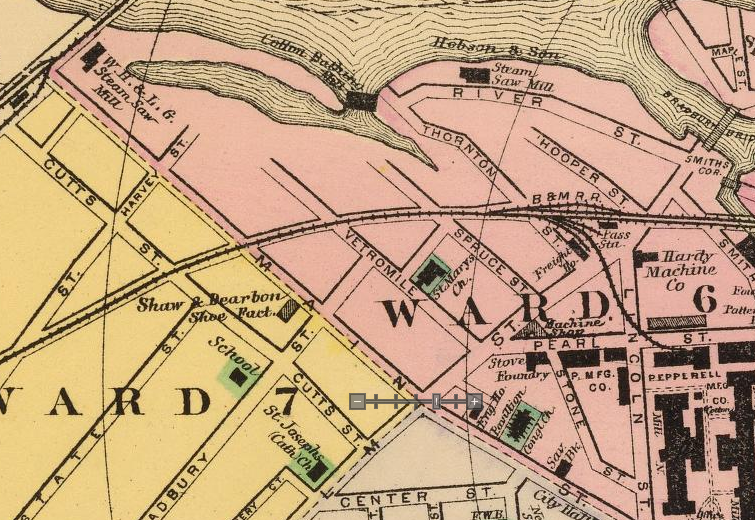 I found a map of Biddeford from the 1930s and found that it is now St. Mary’s Street. Number 19 would have been right across the street from St. Mary’s Church. The 1900 Census also indicates that Margaret worked as a cotton mill corder. There were several mills and garment factories two to four blocks away from where she and little 14-year-old Florence lived. Margaret immigrated in 1870 and her husband, Dennis, was from Maine. Any children they could have had would have been born after 1870 and had to have died before 1900 in Biddeford, Maine. Ancestry has a great database, Maine, Death Records, 1617-1922, which I used to search for clues. Death: 1890 +/- 10 years in York County yielded 6 potential entries. Susan – Father: William, Mother: Ann, not my family. Mary – Transcript Error – Actually age 62 at death not 12, not my family. Catherine – Father: Daniel (but born in Ireland) Mother: Annie Berry – Not my family. The three possibilities need a little closer look. I added Frances for comparison. I see nothing incompatible with these births. All appear to fit the birth and death criteria for children of Margaret. I know that it is somewhat of a stretch to ascribe these three names to the three unknown children of Margaret; however, I think they fit and give a great starting point for further research actions. Until I find something to discredit these names, I’m going to use them as tentative names. Frances Florence Murphy was born on 11 April 1886 in Biddeford, Maine, the third child of Dennis F and Margaret Alice (Mahoney) Murphy [iv]. Not the baby for long, her sister Annie was born 1-2 years later. Then disaster struck the family. Nellie, the oldest sibling died on 4 April 1888 at the age of six. A year later, Annie, her younger sister died on 7 May 1889 at the age of one. Six months later, her brother, Tim died on 14 Nov 1889 at the age of six. Disaster struck once again when her father died sometime before 1900[v]. The 1900 Census finds Florence living with her mother in a rented house at 19 Vitromile (now St. Marys) Street in Biddeford. Florence is attending school. It had to be a tough time for the teenager living with her widowed mother who was working in the mills and renting a house with another family. On 19 Sep 1911 Frances F. Murphy married Herbert Winfield. Whitten in Kennebunkport, Maine[vi]. ; however, it appears they continued to live in Biddeford. Quickly, only 10 months later, the young couple had their first child, Paul Timothy Whitten on 6 July 1912. Before 1918, the Whittens moved to Kennebunkport where their other four children were born. Frances Florence (Murphy) Whitten died in September, 1952[x]. She was buried at Gracelawn Memorial Park, Auburn, Androscoggin county, Maine[xi] on 24 September 1952. Search St. Mary’s Catholic Church Baptism Records for children with the parents of Dennis and Margaret (or Marguerite) Murphy. Search St. Mary’s Catholic Church for death records for Nettie, Tim and Annie Murphy around the dates above. [i] Maine State Archives; Cultural Building, 84 State House Station, Augusta, ME 04333-0084; Pre 1892 Delayed Returns; Roll #: 79 – Nellie Murphy. [ii] Maine State Archives; Cultural Building, 84 State House Station, Augusta, ME 04333-0084; Pre 1892 Delayed Returns; Roll #: 79 – Tim Murphy. [iii] Maine State Archives; Cultural Building, 84 State House Station, Augusta, ME 04333-0084; Pre 1892 Delayed Returns; Roll #: 79 – Annie Murphy. [iv] See my notes above regarding the three unknown children of Margaret Mahoney Murphy. [v] Ancestry.com , 1900 United States Federal Census (Provo, UT, USA, Ancestry.com Operations Inc, 2004), 1900; Census Place: Biddeford, York, Maine; Roll: 602; Page: 12A; Enumeration District: 0229; FHL microfilm: 1240602. http://search.ancestry.com/cgi-bin/sse.dll?db=1900usfedcen&indiv=try&h=22490747. [vi] Ancestry.com , Maine, Marriages, 1892-1996 (Provo, UT, USA, Ancestry.com Operations Inc, 2003), Francis F Murphy. http://search.ancestry.com/cgi-bin/sse.dll?db=MaineMarriageState&h=1370507&indiv=try. [vii] 1920 United States Census (FS) (National Archives and Records Administration), Family Search, Maine, York, Kennebunk, ED-109, Sheet 2B Line 36 (family 51). https://familysearch.org/pal:/MM9.1.1/MF8W-K66. [viii] Ancestry.com , 1930 United States Federal Census (Online publication – Provo, UT, USA: Ancestry.com Operations Inc, 2002.Original data – United States of America, Bureau of the Census. Fifteenth Census of the United States, 1930. Washington, D.C.: National Archives and Records Administration, 1930. T626,), Year: 1930; Census Place: Kennebunk, York, Maine; Roll: 841; Page: 8B; Enumeration District: 0022; Image: 780.0; FHL microfilm: 2340576. [ix] Ancestry.com , 1940 United States Federal Census (Provo, UT, USA, Ancestry.com Operations, Inc., 2012), Year: 1940; Census Place: Kennebunk, York, Maine; Roll: T627_1496; Page: 14B; Enumeration District: 16-38. [x] Private E-mail, Funeral Home to Don Taylor – 2015-10-12. 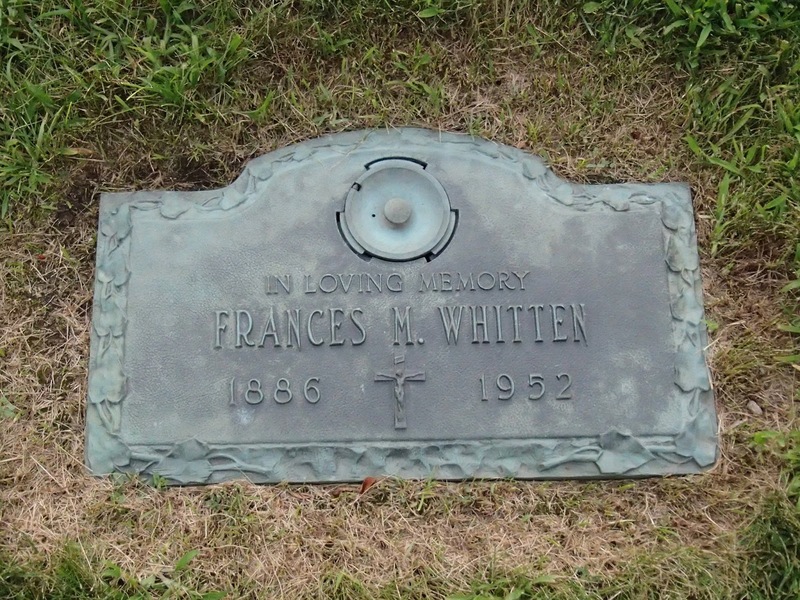 [xi] FInd-A-Grave, Frances M Whitten – Memorial #121464940.